1955 the company changed its name to Royal Crown Company, after its RC Cola brand. It was founded by Claude Hatcher, a Georgia grocer, who began bottling ginger ale & root beer in 1905. As of the middle of April 2008, NEHI had become a brand of Dr. Pepper Snapple Group. Some of the various flavors that NEHI has made over the years include: Dr. Nehi (Dr. Pepper-like flavor), Blue Raspberry, Chocolate, Root Beer, Lemonade, Grape, Orange, Peach, Strawberry, Wild Berry, Berry, Blue Ice Cream, Ginger, Fruit Punch, Blueberry, Watermelon, Lemon-Lime, Cherry, Blue Cream, Red & Pineapple. 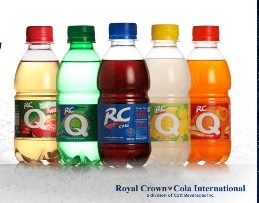 Today the sodas have been re-branded as RCQ & feature the following flavors: Orange, Strawberry, Green Apple, Cloudy Lemon & exotic combinations such as Kiwi Strawberry & Mango Melon.